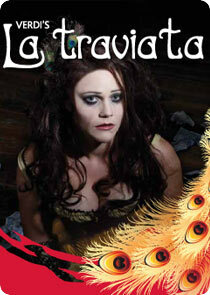 We saw Oz Opera’s 2010 production of Verdi’s La Traviata at the Canberra Theatre. It was the very last of about 64 performances in a long tour of the show to remote, regional and suburban centres. Nonetheless, Annabelle Chaffey was very pleasant to hear and tuneful as Violetta and bass Benjamin Rasheed the best of all as a strong and clear Gaston. Directed by Simon Thew, the chamber orchestra of just eleven players-a quartet of strings, some woodwinds, two horns and a keyboard-played the imaginative orchestral reduction by Andrew Greene superbly and for their numbers made a robust sound. The set, an oval metal art nouveau gazebo, was a symbolic and literal cage. It had to be robust and simple to withstand much packing and unpacking on tour. Yet looking at essentially the same thing through the entire performance was tedious. As well each each character had just one costume which, for Alfredo, was worn in scenes spread over several months of story. A change of clothes would have been more convincing in the portrayal of a wealthy heir. It was a pleasant entertainment, but underwhelming. We enjoyed our evening and, yes, opera is expensive but, at $75 a ticket, we barely got our money’s worth and were disappointed.